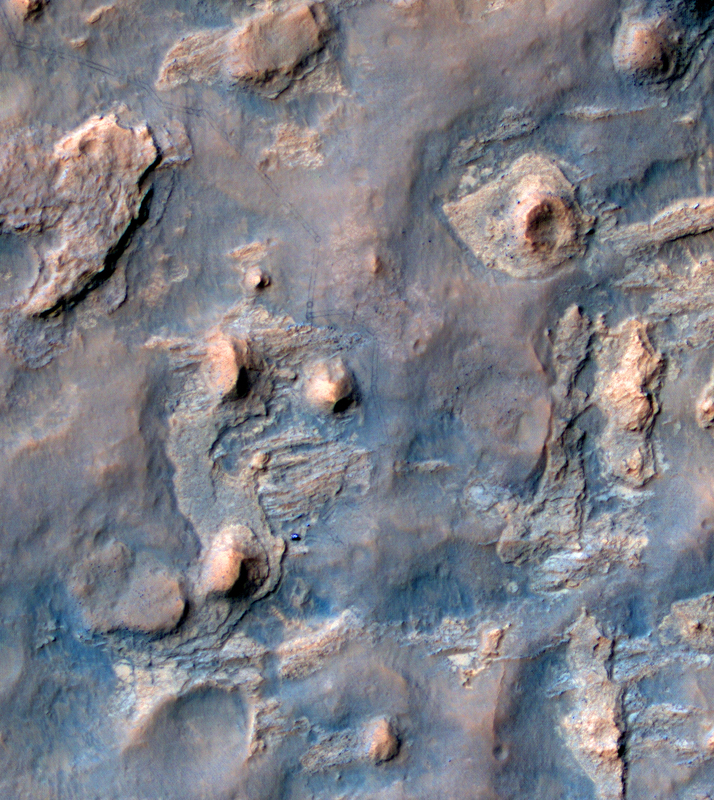 HiRISE - the High Resolution Imaging Science Experiment aboard the Mars Reconnaissance Orbiter captured this stunning image of NASA’s Curiosity rover & its tracks on the surface of Mars on April 11, 2014 – showing the rover at the mission’s current waypoint where MSL will conduct scientific operations including the mission’s third drilling campaign. The photo shows Curiosity near “Mount Remarkable” – the southernmost of three buttes located at “The Kimberley” Waypoint. Curiosity appears blue in the exaggerated color of this image. Kimberley shows four different terrain types when seen from orbit. As Curiosity entered the area, it first saw the striated unit that consists of many dipping beds and shows large variations in grain sizes and degree of erosion. The MSL science team has a number of theories on the formation of this striated unit in different types of fluid environments. Imagery acquired by Curiosity will be used to create three-dimensional maps of the striated unit to allow scientists to identify patterns that may distinguish the different types of material that make up the unit in order to look into the past and identify the environments in which the rocks formed. The next feature of the waypoint are three buttes that have been named Mounts Christine, Joseph, and Remarkable that seem to be consisting of a number of layers showing active scarp retreat. Of particular interest for a potential drilling campaign is the “middle unit” located in between the rocks that form the buttes and lower-lying rocks that form the striated unit. Curiosity will inspect the site later in April to help teams decide whether it will become the next drilling site of the mission to provide more crucial pieces of the puzzle needed to learn about a past Martian environment that may have supported life.